Policy is created through strategic thinking by Presidents and transmitted to Operational leaders via a strategy; which is then operationalized through plans and orders that are executed by tactical leaders that understand the policy, the strategy, and higher headquarter’s plans. Our language must ensure the civilian leaders in war understand their role as the political leader that creates policy. 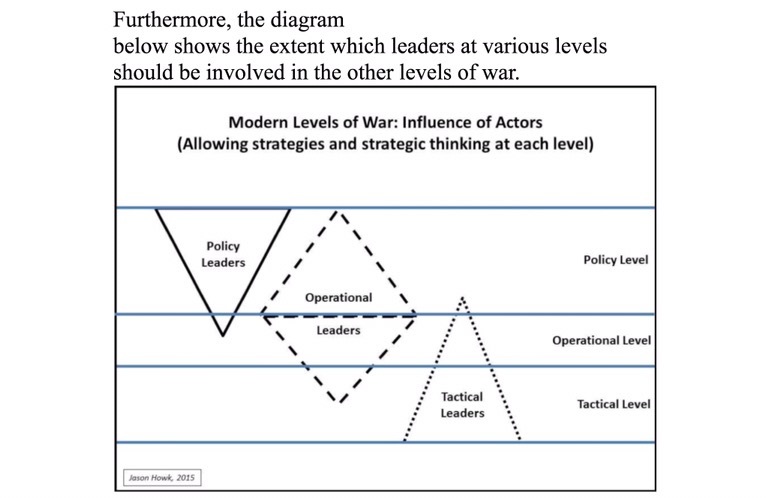 The “strategic level” of war concept can confuse leaders at all levels because they aren’t always sure who owns it. Replacing the term “strategy” with “policy” clearly identifies that the overall direction for a war belongs to the politically elected and those appointed by our elected leaders. Strategy is a vehicle for defining policy, while strategic thinking and understanding belongs to every level of war. The policy maker in chief is the president. He is assisted in his strategic thinking exercise by the cabinet, White House staff, congress, and other policy and operational level leaders across the goverment. That includes generals, admirals, ambassadors, and directors of various agencies. The policy should leave the president in a written strategy form. The strategy, that outlines the president’s policy, identifies ends, ways, and means and must contain enough specificity to allow production of operational plans and orders. 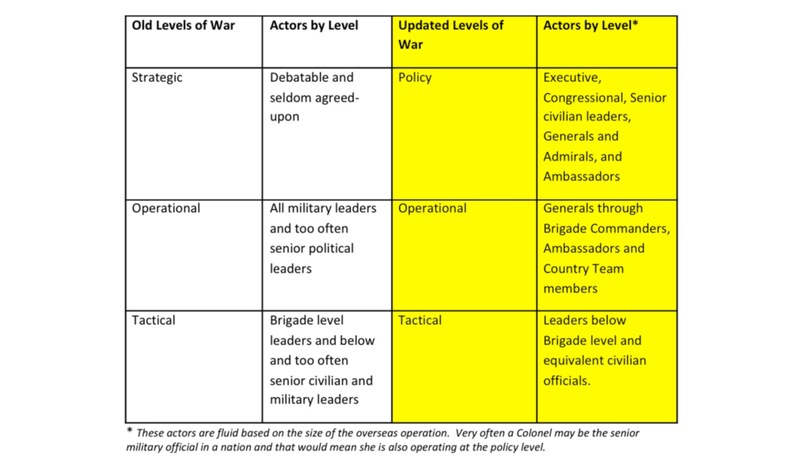 The Operational leaders must be capable of operating at the Policy and operational levels of war while ensuring that their plans and the strategy can be carried out by current or new tactics, techniques and procedures. The tactical leaders are the linchpin of the policy execution. They must understand strategic and operational language that describes the policy; and ensure that their tactical concepts and orders support the policy. It requires strategic thinking and tactical expertise. These leaders must be carefully groomed and selected.